Pocket Pump(12000) - Yuan Chi Sports Enterprise Co., Ltd. 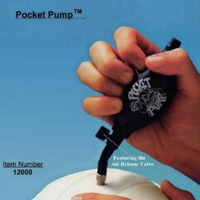 The Pocket Pump is a must for any sport when an inflatable ball is used. Streamlined and small, it goes anywhere you go! 5.0 cm (squeezable bulb's diameter). Recycled PVC material bulb and metal needle. Packaged in blister card. Bulk package also available. Black is the main color (12 pcs per inner box). Blue, Green, and Red can also be available (4 pcs each in an inner box). Air release valve - release pressure without removing needle. Flexible hose - (no more broken needles) reduces strain on ball valve. Compact style fits into your pocket. Safety tested. Conforms to ASTM F963. Appropriate for children six years and over. 12.5 cm hose available to inflate American football helmet's pocket.